The Parable of the Mango Tree. Many, many years ago we got together, a group of us, and we planted a mango seed. It was a special seed brought to us from Australia. It was called the Westminster Party Mango. We were told by our Aussie friends that its fruit would be very sweet and that by its nature it would provide equal shares of ripe fruit for all of us. For years my friends and I watered and sprayed and fertilised the growing tree, sacrificing money which we might have spent on our families or on ourselves. But we rejoiced in our anticipation of the day when our tree would bless us with the large, sweet fruit which we expected from it. The fruit which our Australian friends had promised us we would harvest. The tree grew ever so slowly, but we remained optimistic and happy. After a number of years had passed the tree flowered. The flowers set, and small, green mangoes began to develop. We were overjoyed and sent word to our Aussie friends to let them know that all was going well. Then, one evening when the fruit had reached a fair size we saw several groups of big flying-foxes converging on the tree. Those bilakbokises circled the tree screaming and making lunges at it, one group fighting the other for ownership of the tree. They fought and settled, screeched, clawed each other and ripped the fruit, and in their fighting and flapping they spoiled large numbers of our beautiful fruit, even though the mangos were still green and very hard and much too sour to eat. As the mango season went on my friends and I came each evening with sticks and stones, and even an old, rusty shotgun which belonged to someone’s uncle who had been a kiap’s hausboi. All to no avail. In between their fighting and screaming at each other the bilakbokises chewed and clawed our fruit, and sad to say, even defecated upon us as we stood sadly, looking up at our fast-vanishing fruit. And so it went on, day after day, until the few fruit which survived to ripen were all gone, eaten by the rascally bilakbokises which seemed never to be satisfied. All our hopes, all our sacrifice, all had gone for nothing, it seemed, and we were very sad. One evening towards the end of the mango season when our tree was completely bare, we sat talking amongst ourselves, talking about what might have been, and as we talked an old friend came along and sat down with us. He was a whiteman, one of those Aussies who took citizenship in ’75 so that he could remain to live out his days with us. Our friend shook his old grey head sadly as he looked at the mess of spoiled fruit and seeds on the ground. “I’m sorry,” he said, “I should have warned you. My countrymen were generous to PNG in many ways, and it was kind of them to send you the Westminster mango seed.” He stared up into the ragged branches of our tree as he spoke. Our white friend got up and left us to ponder the problem. Soon, however, we were joined by my country-cousin from the Highlands and Aunty Rabia from the Gulf, and when they heard our story they had plenty to say. “Oh,” they said, “- don’t you worry, you Moresby fellows, its not just you who have put your faith and your sweat into the hope that you’ll get a good mango harvest. These same big bilakbokises, they’re all over the country now! Even in real bush-places. You go to what used to be a good little outstation, running nicely, providing good simple basic services for the people, and all you’ll find today is a barren mango tree, stripped bare by those blary party foxes!” We looked at each other as Cousin-brother went on. For months after this we continued to sit under our tree in the evenings. Even though it had not fulfilled its promise, it was a convenient, quiet place to sit and talk. Often the conversation turned to our problem and what our old dim-dim friend had told us. And then one evening he came along again, for he often walks along the waterfront to the Weigh Inn for a refreshing glass of cold water with some of the other old dim-dims who gather there. Our old citizen-brother stopped when he saw us and sat down. And we told him how puzzled we were about the whole thing, especially his story of the party foxes and how our mango dream had been spoiled. Our friend was quiet for a while but at length he began to speak. Our friend took a long pull on his mutrus and went on. “But the Aussies had a big thing about tribal conflict because of something that was going on in Kenya at the time, and for this reason they were scared of regional or tribal mangos. They were so paranoid that at one time some of the real bigmen worried that there was a ‘Kerema conspiracy’ ready to take over the country just because our smart Kerema brothers were to be found as District Office clerks and storemen all over the country. One old ex-Kiap called Ian Downs even wrote a novel showing how such a revolution might come about. And secondly they said that the District Advisory Council mango wasn’t democratic, although the LGC one definitely was, and the two could quite easily have been coupled together. But they had no imagination, those old Konedobu whitemen. So they abolished Legco, set up the Westminster Party system, and straight away all the bright boys wanted to be party members. Well, everyone loves a party, don’t they? And they’ve all been partying ever since, with no thought for the ordinary people. Here our friend paused to contemplate the stupidity of his erstwhile countrymen. Here our friend paused to draw on his mutrus again. Saying this our old friend got up and left us, heading towards his favourite watering-hole. But as he turned to cross the street he seemed to think of something else to say, and he turned back towards us. Our friend headed off towards his watering-hole, and we sat, still and thoughtful under our barren mango-tree. We remained quiet for a very long time. MORE than 60 professional golfers have registered to compete in this year’s South Pacific Export Golf Open from April 30 to May 3 at the Port Moresby Golf Club in Port Moresby. Tournament director Bernie Morrisey said the increase in numbers clearly showed the popularity of this event amongst the professional ranks, and was largely due to the sponsorship of major sponsor SP Brewery. The major sponsor has backed the event with a total commitment of K185, 000 for the second year and is also supported by a range of corporate sponsors. “We are expecting over 190 golfers in total, including the defending champion Joshua Carmichael and last year’s runner-up Chris Taylor,” Morrisey said. Past winners Troy Kennedy and Chris Downes will also be participating with a host of the region’s top seeded players including Brad Burns, Eddie Barr from Queensland, Heath Reed from Victoria and Richard Gallichan from New South Wales,” Morrisey added. For only the second time in 15 years, the event will also field two Fijian players, Makesh Chand and Krishna Singh, in the biggest event of the PNG golf calendar. Morrisey is also appealing to Port Moresby-based golfers and corporate friends of the PNG Golf Association and Port Moresby Golf Club to contact the organising committee through the Port Moresby Golf Club if they are willing to accommodate some of the professional players. Interested golfers can contact the Port Moresby Golf Club on ph (675) 3255367 to obtain a nomination form and also confirm their eligibility to participate in the event. Nomination forms have been sent out to all PNG golf clubs. CONCERNS have been raised from within and outside PNG following the recent closure of the Insect Farming and Trading Agency (IFTA) in Bulolo, Morobe province. IFTA was the only insect collection, farming and trading agency in PNG. Five employees had been laid off without receiving their final entitlements while IFTA had shifted its operations to Rainforest Habitat at the University of Technology in Lae. Operators of Rainforest Habitat, Unitech Development and Consultancy (UDC), have been tightlipped over IFTA. British scientist Rob Small, who in 2004 did his masters thesis on insect farming in PNG, warned in a paper in 2007 that IFTA was behind on payment to village-based ranchers and collectors. Rising international demand from collectors for the insects of PNG, in particular the endemic birdwing butterflies, has been met since 1978 by the Government-sponsored IFTA. “Until the onset in Papua New Guinea of large-scale logging and mining in the 1990s, and a crisis of governance, IFTA was widely regarded as a conservation and development success,” Mr Small wrote in an abstract of his 2007 paper. “However, analysis of its trading records for 1995-2002 showed that this agency is now struggling to sustain payments to village-based ranchers and collectors. Peace meetings between warring Watut and Biangai tribes began in Wau today with an indefinite liquor ban to be enforced in Wau starting tomorrow. Schools are expected to resume next Monday after being closed since the recent violence between the two tribes in Wau. Acting provincial administrator Patilias Gamato says the process is going to take time but the negotiating team will remain committed to ensuring that peace is restored between the warring tribes. The negotiating team talked to the Biangais in Wau today and will talk to the Watuts in Bulolo tomorrow. Mr Gamato called on both sides to clearly put down their demands on paper, which the team will peruse and discuss further next Saturday. He also called on them to bring out all relevant information including court orders. Mr Gamato stressed that both sides must list their issues properly. The negotiating team has asked for both sides to select six representatives to meet with it. Bulolo MP Sam Basil, meantime, called for peace and common sense to prevail. “As leaders we will maintain our presence to ensure that the situation doesn’t get out of hand,” he said. Provincial police commander Peter Guiness said: “Both sides must respect the law. “Law is law and police will enforce the rule of law. Everything has calmed down, with business returning to normal, but the situation remains tense. Relief supplies continue to flow through, coordinated by Morobe Mining Joint Ventures, operator of the Hidden Valley gold mine. Watut and Biangai tribes meet with a peace-negotiating committee in Wau and Bulolo tomorrow over the recent violence which left two people dead, several injured, houses and property destroyed, and forced the temporary shutdown of the Hidden Valley gold mine and the evacuation of employees. The committee is headed by provincial chairman for law and order Benson Suang and comprises acting provincial administrator Patilias Gamato, Bulolo district administrator Nemsin Kibisep, provincial police commander Peter Guiness, Reverend Gedisa Okomaisa of the Evangelical Lutheran Church of PNG and provincial legal officer Kipireng Kevere. Bulolo MP Sam Basil will also be in attendance. “What we will do is to meet the Biangais in Wau, and then we’ll meet the Watuts in Bulolo,” Mr Gamato said today. “We’ve asked the leaders to bring in the grievances they have. Mr Guiness today travelled ahead of other committee members to Wau. “The situation up there is quite,” he said before leaving. “There are rumours that this committee will make some declarations in relation to the Wau town land,” he said. “What I want to say is that it’s not the responsibility of this committee to declare land. “The responsibility to declare land is vested with the land court or the courts, and so what we will be basically doing is to invite both sides to provide any court documents in relation to court cases over Wau towns, or any land in relation to the mining operations at Hidden Valley. “The peace committee will interpret the court decision and inform the relevant parties. The March 20 and 21 violence came just before Hidden Valley is to pour its first gold, and resulted in the temporary closure of the mine. A long-standing land dispute between Biangai and Watut tribes over ownership of the 2076 hectare McAdam National Park between Wau and Bulolo came to a head as the Watuts gathered in Wau in their hundreds and staged an early morning attack on the Biangai villages. Caption: Hidden Valley Gold Mine general manager Adam Wright (right) presents the K25, 000 to provincial minister for law and order Benson Suang. Picture by SIMON ANAKAPU of MMJV. Morobe Mining Joint Ventures, operators of the Hidden Valley gold mine, has joined the list of donors providing relief for those stricken by violence in and around Wau in the Morobe province. 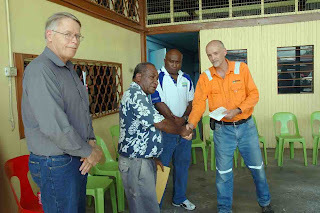 The company last Friday presented K25, 000 to the overseeing committee of the Wau incident at a small ceremony at the provincial disaster office in Lae. General manager of Hidden Valley Gold Mine, Adam Wright, presented the money to committee chairman and provincial minister for law and order Benson Suang. In addition to the logistical support currently being provided to government and police, MMJV also pledged the services of a small general maintenance team for at least one week to assist villagers in the affected areas to at least erect temporary shelters. “Wau is a part of the community in which we work and live” Mr Wright said. Mr Wright commended the Morobe provincial government and Bulolo MP Sam Basil for their swift response in addressing the matter, as well as police, for their professional conduct in ensuring the Hidden Valley resumed operations on Sunday, March 22, just a day after the violence between Watut and Biangai tribes in Wau. In receiving the money, Mr Suang extended the thanks of the people of Morobe and especially of the affected people in Wau to MMJV, and pledged that the funds would be used directly in providing relief to the affected. Representatives of the landowner Nauti, Kwembu, Winima (Nakuwi) Association including president Rex Mauri (Winima), Joel Auwi (Kwembu) and Peter Askai (Nauti) were present at the ceremony. Mr Mauri acknowledged the return of stability to the area and urged all landowner employees to return to their posts at the mine as soon as possible. Police confirmed they would continue their operations in Wau for some time and assured the public of their commitment to maintaining law and order in the area. ONE hour and 45 minutes flying time by Twin Otter aircraft due west of Port Moresby is sleepy Wabo outpost (pictured above). It’s a place never visited with frequency by the administration of Gulf Province or by the province’s political leaders until election time when political opportunists go looking for votes from the people who live there. 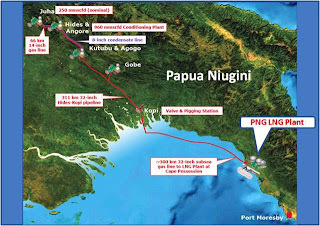 Wabo’s significance to Papua New Guineans and the world at large is it being pointer on the map to the location of Papua New Guinea’s latest and biggest natural gas discovery. Wabo is the entry point to InterOil Corporation, Gulf Province and PNG’s latest “Pandora’s Box” – the massive 382 Million Cubic Feet of Natural Gas per day (MMcfd) Antelope-1 natural gas well with 5,000 barrels of gas condensate per day (BCPD) which translates to 68,700 barrels of oil equivalent per day. Prime Minister grand Chief Sir Michael Somare and spouse Lady Veronica Bura Somare and their eldest children daughter Betha and son Sana made a rare appearance as PNG’s First Family at the head of bevy of PNG VIPs, national international corporate heavies and a strong media contingent in this Gulf Province backwater on Monday, March 2, 2009 where Sir Michael flowed and flared the awesome Antelope-1 discovery. It’s a record PNG and Southern Hemisphere vertical find of its kind for the last 20 years in the Asia-Pacific region. Wabo is a makeshift station in the upper reaches of the Purari River in Gulf Province and is the only inhabited locality. Further downstream is InterOil’s supplies staging camp and barge ramp which is about one hour away if one motored down the river in a banana boat dinghy powered by a 40 horsepower engine. Wabo is an important destination for emerging PNG-based energy house InterOil Corporation – the Canada-registered vertically integrated oil and gas Company that calls Papua New Guinea home. Wabo is also location of the nearest airfield where chartered short take-off and landing (STOL) aircraft land to offload InterOil’s exploration, drill and rig staff and the occasional VIP passengers who then hop onto waiting helicopters for the short but scenic 10 minute shuttle flight to the company’s Elk and Antelope gas fields located 200 metres vertically and anywhere from two to five kilometres horizontally above the banks of the ever meandering Purari River. The Elk and Antelope gas field wells at Elk-1, Elk-4 and Antelope-1 are actually strutting above geologically pear-shaped and overlapping subterranean reef structures located within a radius of 10 kilometres on a tropical forested knoll above the swampy Purari flood plains. No traditional villages are located in the immediate locality of the well heads or the respective drill sites. Baimuru district station is located some 80 kilometres east of Wabo. In the last 12 months political leaders and administration officials of Gulf Province were only able to make it to Wabo and the drill sites at Elk-1, Elk-4 and Antelope as invited guests who “piggy-bagged on the company. Even the presence of so-called Port Moresby-based landowner leaders is seen at this remote outpost before, during or after field trips made there by this writer to the area in the last 12 months. So when relatively junior officers of the Gulf Administration and so-called landowner leaders make public comments about non-inclusiveness in pre-development participatory and benefits sharing checklist in the media from the comfort zones in Port Moresby or Kerema station one has to take their claims, allegation and assertion with not just a grain of salt but with the whole bottle. What has been discovered at Elk and Antelope is natural gas resource of a magnitude that will transform the economic profile of Gulf Province and Papua New Guinea by 2025. The resource is awesome and it’s mind-bogglingly massive. It does not require disoriented and misinformed little Gulf Province political, administrative and landowner opportunists to cry foul when nothing beyond exploration and discovery has taken place. InterOil Corporation must be given praise and accolades for taking the risk 10 years ago to go exploring – when no one else including the world’s biggest or Peak Oil companies would not touch PNG even with a 10-foot pole -- for oil and gas in an area many learned geologists and armchair experts wrote off as “dry bed”. There was nothing to be discovered there, so they all said. After spending K100 million on seismic surveys and spending up to US$35 million a piece on each of its drills in a persistent “never say die” fashion, InterOil Corporation deserves its massive success at Elk and Antelope. The Antelope-1 and Elk discoveries initially provide the basis for InterOil to develop a single train natural gas liquefaction plant in Papua New Guinea. The flaring of Antelope-1 on Monday, March 2, 2009 underpins a first train of 3.5 million tons per annum capacity plant at an estimated cost of US$5 billion. There is scope for that project to be improved to two, three or more trains from the resources at Elk and Antelope and from adjacent unexplored and undrilled prospects. Gulf Province people must not feel left out or ignored in this pre-development period. Having discovered the resources to develop a viable Liquefied Natural (LNG) project, InterOil Corporation as the developer needs to complete all its “midstream and downstream” prerequisite plans, preparations, contracts and logistical arrangements in place. These arrangements also include completing social mapping, landowner identification and integrated landowner groups registered, getting the environmental impact study approved and certified and completing a schedule of preliminary developmental and benefits identification consultations with Gulf Provincial Government and resource and project area landowners. InterOil’s primary goal is to establish a “win-win” peaceful and value-added development and benefits sharing partnership and understanding with all stakeholders right from the beginning. There is enough resource there for Gulf Province, PNG through its State-owned company Petromin Limited and InterOil to share, develop and prosper together for a long, long time after the first 35-year operations of the LNG plant. There is scope for primary aspects of the natural gas conversion and gas condensate preparations to take place within the Purari area prior to being piped to natural gas liquefaction plant adjacent to InterOil’s oil refinery in Port Moresby. Such development promises a minimum life-span of 35 years on a single train operation and scope gets bigger and the life-span increase two-fold or three-fold as additional trains are added to the LNG plant. And so the majority of Gulf Province people -- including landowners, provincial government, provincial politicians and potential politicians, little officers at the dysfunctional Gulf Province administration and Port Moresby-based pseudo-landowners, skeptics and cynics – must remain cool, calm and collected. They must listen to the voice of reason and wisdom from wherever that comes from – National Government, InterOil Corporation, the Gulf Provincial Government or from Gulf’s learned sons and daughters – and accordingly to maximise their benefits, ownership and inclusiveness. There are massive spin-off and sub-contractual works to come out of this project for Gulf Province people and provincial government to ride on to realise the province’s future development and prosperity aspirations. The last thing Gulf people want to do is talk down their opportunity, speculate on issues that are neither here nor there, deny their chance of inclusiveness in benefits to share and to parochialise this awesome economic and social development chance with divisive and partisan politics or creating conflicts through doubtful and questionable land ownership claims. The economic and social opportunities and potential for the future development and prosperity creation of Gulf Province overall is massive. This opportunity requires the absolute support and cooperation of every man, woman and child of Gulf Province. The facts are clear. InterOil Corporation went out of their way to explore for oil and gas initially to find feedstock for their oil refinery in Port Moresby because they could not access Kutubu light crude directly. InterOil has had to compete with international competitors on the open market overseas to buy Kutubu crude at the going international premium price to refine at its Napa Napa oil refinery. InterOil applied for exploration license from the Government of PNG to go exploring. InterOil also spent its money generously to persist with the exploration when others preferred to stay away because of the nation’s economic meltdown commencing from around 1995 and finally easing off around 2005. Opportunists that have emerged from the closets need to be mindful about the damage they can do to all the goodwill that InterOil is prepared to share to ensure a win-win success of its LNG project development. Probing questions pertinent to intent and motive have to be asked when approaches are made secretively to the Prime Minister to grant a certain so-called landowner development association from the Baimuru District legitimacy as being representative of all the landowners and K5 million mobilization funds without the knowledge of immediate drill-head landowners. No one will dispute traditional ownership of land or immigration of people with traditional land ownership to and fro within the Purari delta region and its remote head waters from the time of Adam and Eve. Obviously there are people who have migrated west and spread along the way as far as the eastern bank of the Fly River and east as far as Mapenairu at the mouth of the Purari River and the western most villages and hinterlands of Ihu District. From a low flying helicopter one can appreciate the sweeping vastness of the mangrove and nipa palm swamps that one over flies for 35 minutes to the coast from Wabo or for 35 minutes of the 45 minutes flight to Kerema airstrip. There are landowner groups emerging overnight like mushrooms after one of those Gulf of Papua rainfalls. Nearly all the opportunist landowner groups are new and therefore unknown to the company’s community affairs field workers who are permanently operating in the Baimuru District. *Susuve Laumaea is an award-winning veteran PNG journalist. He works for InterOil Corporation as the company’s Senior PNG Manager for Media Relations & Public Affairs. He also writes a weekly Public Affairs column for the Port Moresby-based weekly Sunday Chronicle newspaper. MONDAY March 2, 2009 was a special day for Papua New Guinea. It was the day PNG announced to the world that it had become the home of the Southern Hemisphere and quite possibly the world’s largest vertical column of natural gas and gas condensate discovery. Prime Minister Sir Michael Somare had travelled with his wife Lady Veronica, daughter Betha and son Sana to InterOil’s Antelope-1 discovery well on the day at the head of an contingent of PNG government ministers and department heads, PNG and overseas corporate guests, InterOil executives and a strong media corps to officially switch it on. He officially flowed and flared the find for experts to determine the exact size of the discovery. And it was a sight to behold as the Prime Minister assisted by InterOil CEO Phil Mulacek (pictured above) officially opened a smaller side valve of Antelope-1 well to flow and flare a small fireworks side-show for onlookers for about 20 minutes before Sir Michael again with Mulacek assisting opened the main valve to flow and flare the well again – this time creating a flame wall that intensified and rose to a height of almost 50 metres. The heat generated the flare was something else. By design, InterOil engineers had already pumped in a couple of million gallons of water from the nearby Purari River into a side well to provide a cooling water curtain to prevent VIP spectators and drill site workers from the intense heat. The ground trembled beneath the feet of all present and natural gas and some condensate rumbled upwards from deep in the earth to be flared in a volcano-like spectacle. The noise generated by the upward rumble and release of gas and condensate was akin to two or three jumbo jets landing simultaneously at Port Moresby’s Jacksons Airport. It was awesome and everyone present had to wear ear-mufflers to prevent ear-drums bursting. A visibly excited Prime Minister later announced to his ministers and departmental officials, InterOil’s guests and the media at the Antelope-1 site: “It is with great pleasure that I announce a World record natural gas discovery in Papua New Guinea. “This discovery will place PNG as a co-leader with Australia in supplying LNG to the Asian Markets. “The Antelope-1 well, which today flowed at a new world and PNG record rate of 383 million cubic feet per day with 5,000 bbl of condensate and a third party confirmed-capacity of 17.7 BCF (billion cubic feet per day) of gas, places PNG as one of the best quality gas producers in the world with a 760-metre column of gas. “For our country, this marks an accomplishment that was achieved through many years of mutual cooperation between the government of PNG and InterOil Corporation. “InterOil has been a continuous supporter of our country for over a decade. The company committed resources and capital over the entire time-frame to building the largest infrastructure in our country and making a substantial contribution to the country’s outstanding GDP growth and employment. “InterOil built and operates the refinery at Napa Napa, streamlined and manages our largest refined product distribution network, and conducted the largest exploration program in the country’s history. “This has culminated in the international success we share today,” Sir Michael said on Monday, March 2, 2009. At the “burn-off” the Antelope-1 well flowed at 382 million cubic feet of natural gas per day (MMcfd) with 5,000 barrels of condensate per day (BCPD) for a total 68,700 barrels of oil equivalent per day (BOEPD), setting a new record rate for Papua New Guinea. The flow test recorded a maximum calculated rate at 545 MMcfd for a dry gas reading through a 6 inch capacity choke that was only opened to 3 ½ inches or about 30% of capacity. Conservatively adjusting the dry gas flow rate of 545 MMcfd to compensate for 13 Bbls of condensate per MMcf resulted in the foregoing 382 MMcf effective gas flow rate. “As far as we are aware, the world record breaking gas flow rate from a vertical well confirms other records recently established by the well, such as the largest vertical hydrocarbon column height in a single onshore carbonate reef structure and the largest calculated absolute open flow (CAOF) at 17.7 billion cubic feet of natural gas per day,” InterOil Chairman and CEO Phil Mulacek said. “The well results establish the country of Papua New Guinea as a world class gas resource base in close proximity to the largest and most well developed LNG market in the world. “InterOil believes the Antelope-1 well clearly confirms the gas resource potential sufficient to proceed with plans to build a liquefied natural gas (LNG) plant on company land next to the InterOil refinery in Port Moresby. “Antelope-1 and previous wells, have confirmed over 120% of full capacity, estimated at 500 MMcfd, for the first proposed LNG train. “Third party resource estimates are underway and will be released when completed in the next few weeks. “Recent settlement agreement with Merrill Lynch uniquely positions InterOil to enter direct negotiations with industry partners on an ownership stake in the Elk/Antelope structure, an ownership stake in the proposed LNG plant and long-term LNG offtake contracts,” Mulacek said. InterOil’s PNG partner and State-owned company Petromin Limited hailed the discovery as a significant boost to underpin PNG’s second Liquefied Natural Gas (LNG) project. “Let me firstly thank the Prime Minister, Minister for Petroleum and Energy and other Ministers of Government for facilitating (development of) Papua New Guinea’s second LNG Project,” Managing Director and CEO Joshua Kalinoe said. “Declaration of Location and the extension of the License areas (by the Petroleum and Energy Minister William Duma on site during the official flowing and flaring of Antelope-1) now pave the way for Petromin and the Operator, InterOil to commercialize the project. “The flaring of Antelope 1 on Monday, March 2, 2009 underpins a first train 3.5 million tons per annum capacity plant at an estimated cost of US$5 billion. As we prove up reserves through further exploration drilling we will add another one or two trains. “For Petromin, the State and people of Papua New Guinea this will be our single largest petroleum project where Papa New Guineans will be given the opportunity to be active participants in the whole value chain. “The Board and management of Petromin made the decision to farm-in on the Elk/Antelope project after going through an internal risk assessment process. “When we signed the Investment Agreement with InterOil in October last year, our petroleum geologists and reservoir engineers assessed the risk and made the observation that the Elk/Antelope field is less risky and highly prospective and recommended the farm-in arrangement. “This second LNG project for PNG is unique and innovative in many ways. One such innovation is that there is a lot of flexibility on how the project will eventually be structured so that InterOil can bring in strategic partners to underwrite the LNG project. “Further more, all the high quality condensate will be sold to the InterOil Refinery in Port Moresby, adding more value to the Papua New Guinea economy. “The condensate extraction is planned to commence in 2010. So some benefits will accrue to the project partners years before the actual gas is sold as LNG. “The innovative and competitive approach to project financing that we are currently pursuing collectively with InterOil and Pacific LNG will ensure that no State assets will be sold or swapped to finance the State’s equity. “In fact Petromin with the support of InterOil and Pacific LNG is working on a financing structure that would ensure that State’s full 20.5% equity in the upstream and 10% in the midstream will not be diluted either directly or indirectly. “We are determined to ensure that the State and people of PNG maximize their gains from this project both through the revenue stream as well as through technology transfer. Petromin and InterOil have forged a very solid long term strategic commercial partnership. “In this regard, I am happy to announce that InterOil and its downstream partners have agreed for Petromin to co-market its share of the LNG. “This will make Petromin a fully integrated petroleum company in which Papua New Guineans will for the first time be given the opportunity to participate in the full value chain of the LNG business. “This is what our political leaders envisaged when Parliament created Petromin in 2007. InterOil has now made it possible for this vision to be realized. “We are determined to promptly deliver the second LNG project to Papua New Guineans on schedule in 2014 and the operator, InterOil has commenced the pre-FEED process, including contractor identification, financing, marketing, landowner study, and environmental study. “Work is in advanced stages in putting together the PDL application. We want to thank the Minister for his expeditious actions in declaring the location of the gas find and extending the exploration licenses. “We know that the project has the unequivocal support of the Prime Minister and our political leaders, especially members of Cabinet. Accordingly we look forward to the project being given priority consideration as far as regulatory and statutory approvals are concerned. “In fact, we are pleased to note that the approval process for the LNG Project Agreement for the liquefaction plant is progressing well. “We understand that the Ministerial Gas Committee has given it the fullest attention. “We now got the gas, international LNG recognition, and all we need is the LNG Project Agreement to be approved so that we meet the construction deadline,” Mr Kalinoe said. The global financial crisis has wrought havoc around the world, with some of the world’s major banks like Lehman Brothers having collapsed, and others forced to merge or surviving with huge government bailout programmes. Major economies are either in recession, or their growths have dramatically slowed. Big companies around the world like Toyota of Japan have reported unprecedented losses, and have cut back production and sacked workers to stay afloat. With a lot of uncertainty and some level of distrust hanging over the global scene, banks and financial institutions are refusing to lend money, and even viable companies are now in trouble or unsure about their future. Against this very gloomy backdrop, some in government found it not unreasonable to describe it as a “coup” when it was announced that the government had secured the necessary funding from an international source to finance its equity in the PNG LNG project (map above). The LNG project is a massive project which will cost about US11$ billion. Project operator ExxonMobil and its partners plan to draw gas from reservoirs in the Southern Highlands province, and transport it by pipeline to the Konebada Petroleum Park outside Port Moresby where it will be processed and exported. The government decided it would take up the full 19.4% equity in the project, and not sell it down. It had to secure financing to take up this equity, and chose to seek the funds offshore, aware that failure could raise questions about the credibility of the entire project. In November last year, State Enterprises Minister Arthur Somare, who had led the negotiations for funding, announced that a deal had been struck with International Petroleum Investment Company (IPIC). An agreement was concluded by the Independent Public Business Corporation on behalf of the National Government with IPIC, which is wholly owned by the Abu Dhabi Government of the United Arab Emirates. Essentially, the government under this agreement is exchanging its 17.56% stake in Oil Search, held by IPBC as trustee, for $A1.6 billion from IPIC under an exchangeable bonds arrangement. The deal attracted its fair share of criticism from the Opposition and the Treasury Department. But it also won applause from leaders of some financial institutions that attended the PNG Mining and Petroleum Conference in Sydney in December. A legal action by Petromin Ltd threatened to derail the financial deal. Petromin CEO Joshua Kalinoe believed his organisation was legally vested the power to advance the LNG project, and not IPBC. The legal action was later withdrawn, removing an unwanted hurdle to the deal. Last week, Minister Somare announced that IPIC had deposited 1.681 billion Australian dollars into a quarantined bank account in Singapore. The account is ‘quarantined’ because the use of the funds will be exclusively for the purposes of funding the government’s equity and its contribution to the capital expenditure of the Project. Funds will be made available when required as the PNG LNG Project proceeds from the current front end engineering and design (FEED) stage to project construction. The LNG Project consortium led by ExxonMobil has set a timetable that will result in a final investment decision by the end of this year with project implementation to commence in early 2010. Mr Somare reiterated the point to Members in Parliament last week that the PNG Government’s financing arrangement with IPIC provided an added element of certainty to the project, which promises to transform the national economy when gas is exported in 2014. The finalisation of this financing deal also adds greater confidence around the Project, especially at this time when the Project is focused on tying up marketing, debt financing, and engineering, construction, and procurement contracts before Project Sanction in October and Final Investment Decision in December this year, the minister added. Given the stage the PNG LNG Project is currently at in FEED, the Project’s eventual delivery commencing early next year will position Papua New Guinea as the newest gas supplier to the world. According to Mr Somare, the PNG LNG project is prioritised as number five in the global pipeline of LNG projects earmarked for development. In the Asia Pacific region, the PNG LNG Project is ranked number one. Clearly, the Government is committed to ensuring that Papua New Guinea can commence LNG exports by late 2013 early 2014. With financing for equity now securely in the bank, the government needs to move quickly to address the concerns of landowners, and to have in place the benefit sharing agreement. Landowners in Southern Highlands, Gulf and Central provinces need to be satisfied about their involvement in this massive project. The rest of PNG will also need to be assured of their benefit in this project. INSECT Farming and Trading Agency (IFTA), the only insect collection, farming and trading agency in Papua New Guinea, has shut its operation in Bulolo, The National reports. An insider, who requested anonymity, said last week the agency had laid off five employees without paying their final entitlements for reasons that were unknown. The source said the agency shifted its operations to the rainforest habitat at the University of Technology in Lae last November. IFTA now owed insect farmers around the country, including those in Buka, Highlands, Oro, Sepik and parts of Morobe, payments for insects sold to it, the source said. “It had also failed to notify the farmers of its new location,” the source said. The insider said the Unitech Development Consultancy (UDC) shut down IFTA at Bulolo without prior arrangement and notice. “It’s a slap in the face for the five women and the farmers who had contributed to the agency and the country,” the source said. The closure has left many rural insect farmers in a spot. Most of them have been checking on the old office, only to find its doors locked. Insect farming is a thriving business in the country – insect art frames are sold locally and dried species are exported to several countries. It has collected and identified more than 7,000 species of butterflies and other insect species, including the largest Alexandra butterfly, the largest Hercules moth and largest wingless stick insect. Attempts to get comments from UDC director Jeffery Zuzu were unsuccessful. Another source said the company relocated to solve logistical problems. I received the story below from a friend. It’s quite touching, more so for me, as this week marks the first anniversary of the death of my beloved wife Hula. Suddenly I didn't know how to open my mouth. But I had to let her know what I was thinking. I wanted a divorce. I raised the topic calmly. She didn't seem to be annoyed by my words, instead she asked me softly, why? I avoided her question. This made her angry. She threw away the serving spoon and shouted at me, "You are not a man!" That night, we didn't talk to each other. She was weeping. I knew she wanted to find out what had happened to our marriage. But I could hardly give her a satisfactory answer; she had lost my heart to Dew. I didn't love her anymore. I just pitied her! The next day, I came back home very late and found her writing something at the table. I didn't have diner but went straight to sleep and fell asleep very fast because I was tired after an eventful day with Dew. When I woke up, after perhaps two hours, she was still there at the table writing. I just did not care so I turned over and was asleep again. • She didn't want anything from me, but needed a month's notice before the divorce. • She requested that in that one month we both struggle to live as normal a life as possible. Her reasons were simple: our son had his exams in a month's time and she didn't want to disrupt him with our broken marriage. This was agreeable to me. • But she had something more. She asked me to recall how I had carried her into the bridal room on our wedding day. She requested that everyday for one month I carry her out of our bedroom to the front door every morning. My wife and I hadn't had any body contact since my divorce intention was explicitly expressed. So when I carried her out on the first day, we both appeared clumsy. Our son clapped behind us, "daddy is holding mummy in his arms..." His words brought me a sense of pain. From the bedroom to the sitting room, then to the door, I walked over ten meters with her in my arms. She closed her eyes and said softly; ‘don't tell our son about the divorce’. I nodded, feeling somewhat upset. I put her down outside the door. She went to wait for the bus to work. I drove alone to the office. I drove to office.... Jumped out of the car swiftly without locking the door. I was afraid any delay would make me change my mind... I walked upstairs. Dew opened the door and I said to her, Sorry, Dew, I do not want the divorce anymore. She looked at me, astonished, and then touched my forehead. "Do you have a fever?" She said. I moved her hand off my head. "Sorry, Dew," I said, "I won't divorce. My marriage life was boring probably because she and I didn't value the details of our lives, not because we didn't love each other anymore. Now I realize that since I carried her into my home on our wedding day I am supposed to hold her until death does us apart." The small details of your lives are what really matter in a relationship. It is not the mansion, the car, property, the money in the bank, blah....blah.blah. These create an environment conducive for happiness but cannot give happiness in themselves. So find time to be your spouse's friend and do those little things for each other that build intimacy. Do have a real happy marriage! Captions: 1. 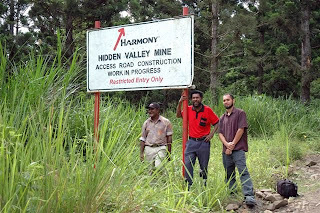 The author (centre) with colleagues Sampson Bonai (left) and Vii Killar at the start of the Hidden Valley Access Road at the back of Bulolo. Picture by SIMON ANAKAPU. 2. Panorama of the Bulolo and Watut valleys from the Hidden Valley Access Road. Picture by SIMON ANAKAPU.3. Welome sign just outside Wau town.Picture by RONALD DEL VALLE. 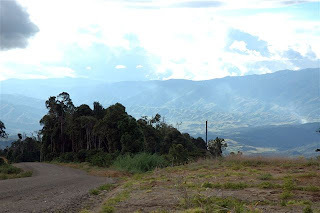 In July 2003, I became arguably the first Papua New Guinea journalist ever to walk the old Black Cat Trail between Salamaua and Wau, Morobe Province, which makes the Kokoda Trail seem like a Sunday arvo stroll in the park. This is because it is not an established trail like Kokoda, on which hundreds of trekkers regularly tread, but a forgotten gold rush and World War 11 course that passes through some of the toughest and most-hazardous terrain in the world. Leech and snake-infested jungle, moss -covered rocks and fallen tree stumps, precarious cliff crossings, and numerous river crossings make the Black Cat one of the toughest tracks in PNG and the world. After five days of torture through leech-infested country, slippery logs and rocks, as well as numerous other obstacles straight out of a commando-training manual, we descended into kunai country and were rewarded with our first glimpse of Wau. I wrote articles for local and international newspapers, magazines and websites – being then employed by the PNG Tourism Promotion Authority - and it has been greatly because of this exposure that the Black Cat has developed into a tourism icon over the last five years. To this day I still dream of conquering another WW11 icon, the Bulldog Trail, which stretches between Wau and the Gulf province. 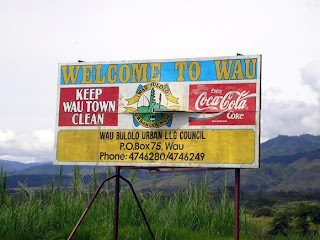 Last year, I again visited Wau and Bulolo, and certainly could feel the song in the air as we drove up the scenic Wau-Bulolo Highway from Lae. There was a feeling of excitement and optimism akin to the historical gold mining days of the 1920’s and 1930’s. The discovery of gold at Edie Creek above Wau in 1926 sparked off a gold rush of massive proportions which led to the exploitation of the rich deposits of the Bulolo-Watut river system by large-scale mechanised mining. The Bulolo region was at the time one of the largest gold fields in the world. A total of seven dredges scoured the valley floor, dredging thousands of tones of high grade gold-bearing ore. Remote Hidden Valley near the border of Central and Gulf provinces has become a hive of activity as Morobe Mining Joint Ventures work on a renaissance project. Evening over the Bulolo and Watut valleys as we drive back is a sight to behold as we watch the panorama unfold. “This is God’s country,” remarks MMJV public relations manager Simon Anakapu. Last Saturday, whilst in the office, my colleague and Wau-Bulolo veteran Yehiura Hriewazi told me that trouble had erupted in Wau. The news broke my heart as places like Wau, neighbouring Bulolo, Watut, Aseki and Menyamya are very special to me. Violence erupted in Wau last Friday and Saturday, leaving two people dead, several injured, houses and property destroyed, and forcing the temporary shutdown of the Hidden Valley gold mine and the evacuation of employees. The incident comes just before Hidden Valley is to pour its first gold and could have severe repercussions for Papua New Guinea on the international mining scene. A long-standing land dispute between Biangai and Watut tribes over ownership of the 2076 hectare McAdam National Park between Wau and Bulolo came to a head as the Watuts gathered in Wau in their hundreds and staged attacks on the Biangai villages. The news sent shockwaves through Morobe province, Papua New Guinea, and the world, as so many expatriates worked or were born and raised in Wau. Among these was Jamon Alex Halvaksz, assistant professor of anthropology at the University of Texas in San Antonio, USA. He emailed me telling me of how distressed he was at the goings in Wau, as while in PNG, he had spent almost all his time in the Biangai villages of Elauru and Winima doing his research paper. Prof Halvaksz was in PNG in 1996, 1998, 2000-2002, and again in 2005, working on his paper about the affects that colonialism has had on Biangai development aspirations. It is a fascinating paper which touches on many things, including the infamous ‘Kaisenik Killings’ of 1926-1927, and could I not sleep for want of reading it on Monday night. Widely reported and a common feature in miners’ monologues, the ‘Kaisenik Killings’ remain a significant event for contemporary figures in and around Wau and feature centrally in discussions with Biangai about the arrivals of whites. It was quite ironic, and a frightening sense of déjà vu, that Kaisenik was burned to the ground by rampaging Watut tribesmen last Saturday. “The history of Wau township in Morobe province, Papua New Guinea, is intimately linked with the development of gold mining throughout the region,” Prof Halvaksz writes in the abstract of his paper. “The site of a series of gold rushes in the 1920s, Wau emerged as an early administrative outpost, a town complete with all the trappings of frontier Australian communities. “In recent years, Wau has declined, and the Biangai communities reflect on this decline in ways that manipulate both the early colonial discourses and their own. “In this paper I examine the gold rush, how early prospectors conceptualised the colonial project, and what Wau’s subsequent decline has meant to the Biangai who now pursue new mining opportunities. Reading Prof Halvaksz’s paper gave me a whole new insight into the Biangai people and the history of Wau and the gold rush days. He recommended quite a few papers about the Watut and Biangai by John Burton, who used to work for Hidden Valley, including one available online - http://rspas.anu.edu.au/papers/rmap/Wpapers/rmap_wp01.pdf - in which he writes about Watut social organisation. His last paragraph is most telling. My prayer, after reading all these, was that peace could reign once more in Wau so that outsiders like me can take our families there to enjoy its unmatched beauty.